Vinegar (cider, distilled), water, soybean oil, sugar, high fructose corn syrup, honey dijon mustard (water, mustard seeds, vinegar, salt, white wine, citric acid, tartaric acid, spices), corn syrup, mango puree, pineapple juice concentrate, tomato paste, salt, spices, molasses, chipotle chili pepper, worcestershire sauce (distilled vinegar, molasses, corn syrup, water, salt, caramel color, garlic powder, sugar, spices, tamarind, natural flavor), xanthan gum, garlic powder, onion powder, dehydrated red bell pepper, potassium sorbate and calcium disodium edta (used to protect quality), natural flavor. 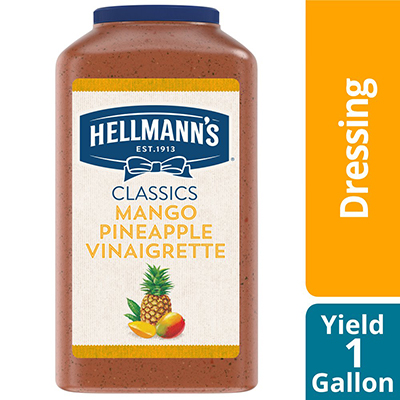 Hellmann's Mango Pineapple Salad Dressing is a versatile gluten-free dressing made with real pineapples and mangos and does not contain artificial flavors. Well suited for fruit salads, kabobs or grilled fish and mixing with crispy fresh greens to create an innovative salad. As part of Unilever, we understand consumers, your guests. We use this knowledge to help chefs and caterers keep up with people’s changing tastes. The Hellmann's name is recognized throughout the world for unrivaled quality and flavor and its commitment to real simple ingredients, like real mango.